from the blue chair: Olfa's 35th Anniversary and A Giveaway! I love my rotary cutter. I have carpal tunnel, and I can't imagine using scissors to cut all of my pieces out when quilting - it would hurt so much. I just love everything! Especially when it is organized! Awesome giveaway! I couldn't quilt without a good iron with lots of steam! I love my rotary cutter and 6x24" ruler- However, that rotating mat looks awesome! I love my Olfa rotary cutter. I can't imagine quilting without it! Seriously, it's my favorite tool. I love my rotary cutter. Started out with scissors. My accuracy is so much better now. A good ma to go along with the rotarty tool! HELLO, love my rotary cutter! I would be lost without my rotary cutter!!! Thanks for the chance and Happy Birthday Olfa!! I love my frosted 6x24 in ruler. Outside of the normal stuff (rotary, mat, ruler, etc.) I love using my little thread snips. And I admit I have a favorite seam ripper too. I cannot sew without my stiletto to guide (and push) fabric. Thanks for the chance. I do have to say it is a toss up between the rotary cutter (and all my mat and rulers) and my Gingher scissors. Of course, my Singer sewing machine is still number 1. When I first learned to quilt, the rotary cutter became my cutting tool of choice. I have always used Olfa cutters and mats. I do believe that if you use the companions together, my blades have lasted longer. Thanks for the giveaway! I can't imagine being a quilter without my rotary cutter! I love my portable cutting and pressing mat! It has to be my rotary cutter and it's an Olfa! Deja vu - I could swear that not only have I read this post before, I've responded - maybe I read it on my phone and forgot to mark it as read? I have an Olfa comfort grip rotary cutter and I love it! What a wonderful invention - the rotary cutter! It's my favorite. My favorite sewing tools are actually the totes that I put my quilting projects in while they are in progress. It would have to be my rotary cutter. I pretty much use it for everything. Hmmm... I'd have to say that one of my favourite sewing tools is the pair of scissors that my husband bought me for Christmas. They're super sharp, oh so pretty, and he picked them out and sourced them on-line all on his own! With my 56 year old eyes, my favorite tool is my Ott light! I love my rotary cutter, mat and sewing machine. Oh Olfa - where would we all be without you!!! I love my sewing machine. That is considered a tool, right!!? My favorite sewing tool is probably my rotary cutter.I love cutting perfect little stacks of fabric that turn into a beautiful quilt. I love your block!!! Rotary cutter is a must, would like to try an Olfa. Cutter and mat my favorite tools and also sharp scissors! I think I love my rulers. So easy to use, making cutting and measuring mega easy. Of course rotary cutter and rulers are required; I also love my little Purple Thang. So lovely! Would love to win this sweet prize. My seam binding maker is my best used tool. And my seam ripper, haha! I like my olfa rotating mat for trimming up small blocks without having to move the block around. It has to be my rotary cutter, with a fresh, sharp blade in it....makes me smile every time I use it ! Love my rotary cutter and my snips! My favorites are my ergonomic Olfa rotary cutters - 45mm & 60mm. Thanks. My seam ripper, of course! I love my chalk liner pen and my clips! Favorite is my rotary cutter. I've had it for a long time and I need a new one. Of course I love my rotary cutter the most! Lately I've been spending too much time with my seam ripper. Rotary cutter is definitely a favorite. That rotating mat looks awesome. A friend of mine recently passed away from cancer. Her mother asked me to make t-shirt quilts for her son's out of her cancer t-shirts. So right now my favorite tool is my 15 in square ruler, and of course my rotary cutter. I love a pair of super sharp small scissors and of course rotary cutter. My seam ripper and thread snips. Yay for Olfa! I really do like the rotary cutter and mat combo. I recently cut a bunch of stuff with scissors and was sadly missing my rotary cutter. Well, obviously my favorite tool is my rotary cutter(s) and ruler. I don't think I'd be quilting much if I had to use scissors. I love my scissors and rotary cutter! I love my hera marker. It makes my quilting so much easier! But the rotary cutter is close behind! I love my rotary cutter. It is a whole different world from using scissors and templates. I can't live without my self-healing mat. LOVE IT!! Love my olfa rotary cutter can't live without it, use it daily! My rotary cutter and mat. They make sewing life so much easier! Happy 35th Anniversary to Olfa!!! Thanks for allll your grrrrreat products!!! My favorite tool is that rotating mat and yes I want another one!!! My favorite tool would be my thimble! My favorite tool is my 45mm Olfa rotary cutter with ergonomic squeeze handle...love it! I have three favorite tools, my rotary cutter, my thread snips and an artist fan brush that I use to clean my machine with. it's perfect for getting all the lint out from the feed dogs and hidden nooks and crannies. My favorite is Elmer's School Glue followed by my pretty blue Olfa rotary cutter and my Frixion pens. G Fahrion at comcast dot net. Rotary cutter for sure, I dont know how I lived without it, truthfully. Thank you for the giveaway! Walking foot & rotary cutter. Let's see besides my cutter, spinning mat, large ruler it has to be the seam ripper. Wonderful tool! I love my rotary cutter, I feel inept without it! my favourite sewing tool is my juki sewing machine, i love it..
i would love to be the winner of the olfa give away..
Hmmm. Rotary cutter is #1 but recently got a rotating mat and love it. My tube turner, though if I had a rotating cutting mat, I'm pretty sure that would be my favourite. I'm a hand-quilter so I'm pretty into having the right needle. But, boy, haven't rotary cutter changed everything for the better? I do love my rotary cutter but am currently totally in love with my hex and more ruler! Rotary cutters are the best invention known to quilters, and I also love to use temporary adhesive spray. Thanks! My rotary cutter is my favorite! Gripping things can be tricky sometimes due to a joint disease I have, but the way my rotary cutter is shaped the grip has never been a problem! I'd never have the patience to cut anything with scissors, so YES the rotary cutter is the best invention ever and my Splash cutter is my favorite! Gotta have a rotary cutter and a very sharp pair of small scissors. I don't use seam rippers but my small sharp scissors... I cannot quilt without them. Rotary cutter! Couldn't live without it. Without my Olfa rotary cutter I would be lost, but my rotating mat sure comes in handy. I love my rotary cutter and my quilters magic wand! Thanks for the chance to win! I really like my rotary cutter-could always use a new one! What a cute little block. 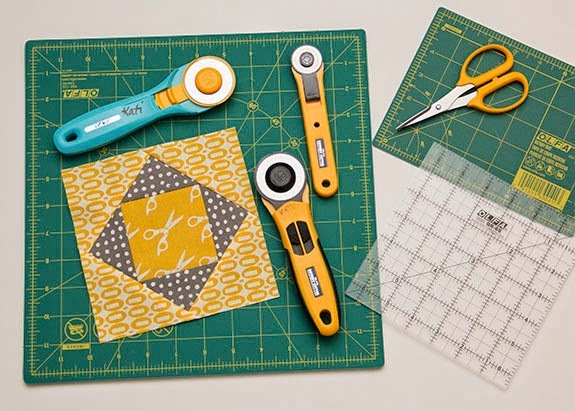 I would love to win this giveaway - I really need a small cutting mat and rotary cutter! 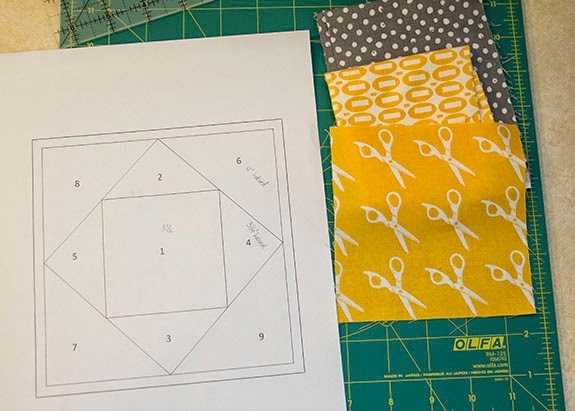 It has been so long since i have used a scissor to cut out patterns that when i broke my wrist i had to use a scissor to trim a block, i was in total disbelief that quilters ever cut this way! Couldnt wait to have the cast off so i could use my trusty useful rotary cutter once again! Love love my rotary cutters. Several different sizes and each is my favorite when it's the right tool for the job! Thanks for the giveaway! thank you so much for the opportunity to win . Olfa is tops. and I love yellow and blue anyhow. Your block is so precise. I love my thimble, and then my cutting mat. Thank you for the giveaway. 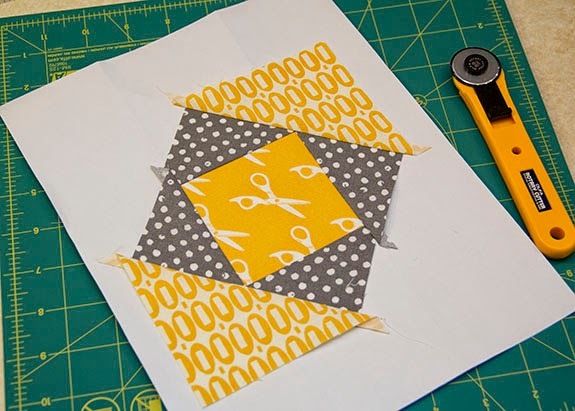 It will be perfect for trying paper piecing. My favorite tool is the large rotary cutter (60mm) for cutting batting and quilt backs. I too have been wanting one of those rotating cutting mats. How great would that be for trimming HST's!!!! My favorite tool are my pins. I have several different kinds for different purposes. My rotary cutter, it is Olfa's 45 blade. Great invention. Thanks for the giveaway. My favorite sewing tool is my wide ruler. Thank you for the wonderful giveaway. Like many others, I'd have to say it is the rotary cutter. With or without the ruler! Thank you. I love my rotating mat, but in the end my ion is the most importing sewing tool. I love, love my walking foot!! Thanks! How did we ever do it without the rotary cutter. I only have Olfa cutters and prefer the 45mm size. I love it when Olfa brings out cutters in colors or patterns. I always buy them! I hope the Olfa people are listening! More colors please!!! My favorite tool is my large cutting mat. I use it for everything. I could definitely use a new rotary cutter. I've never had Olfa before, and I would love to try it out. I would have to say my seam rippers (yes, plural). I'm not sure what this says about me . . .
My sewing machine! I could not do any of it without the machine! I have to say my sewing machines... what can I say I just love them! 1 favorite tool. My hands are right up there, my sewing machines, rulers and rotary cutter as well. Thank God for simple things. I can't baste without my Kwik Klip! I love my self healing cutting mats! Wish I had more...LOL! I also love my Ott-Lite! I love my rotary cutter & mat. Makes cutting so easy! The rotary cutter has to be my number one! I love my ham and also my pinking rotary clipper. I love my thread snips and my rotary cutter! I was having such a hard time thinking of my favorite because so many things are essential and then I read an earlier comment and I have to agree that my various sewing totes and bags are my favorite because they've allowed me to carry all my sewing supplies for the past two years as we've led a very gypsy type life. My best friend is my seam ripper. I couldn't sew without my razor sharp lefty scissors! 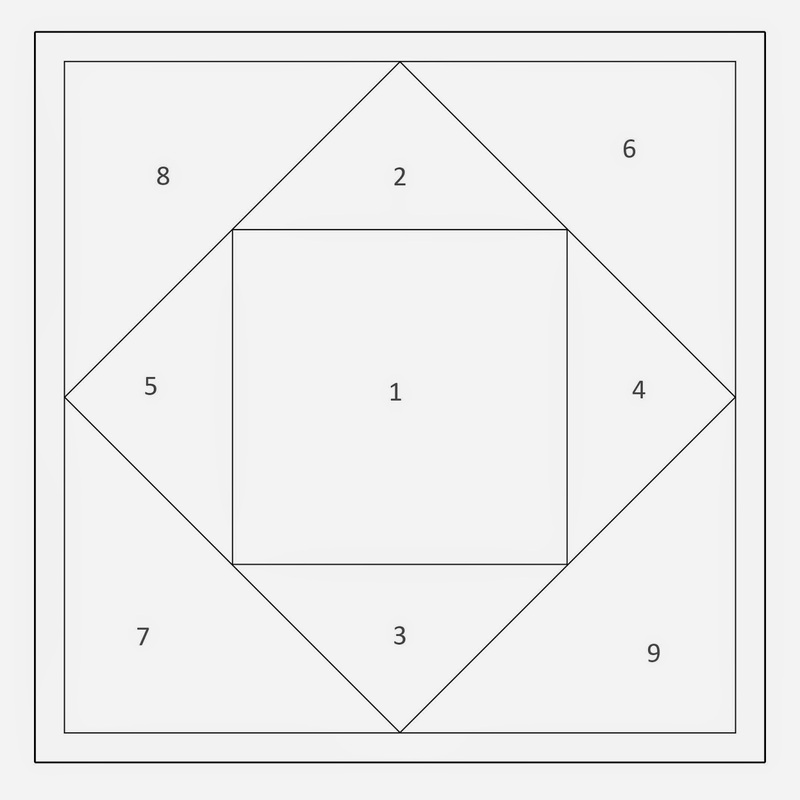 The Creative Grids ruler 3 1/2 x 12 is my favorite. I could not live without my rotary cutter! My favorite sewing tool is my circle cutting Olfa rotary cutter....that is the slickest tool to make perfect circles in a hurry...and NO MATH needed! ha ha! I'm using it to make a favorite picnic quilt using old jeans! Slick I tell you! Thanks for the chance at the giveaway! I love my rotary cutter and my clover clips. I use a hemostat to fish out thread when it gets stuck in my machine.... a very handy instrument! I can't imagine only having scissors to cut the fabric! Yikes! My rotary cutter, mat, and ruler are invaluable. The rotary cutter changed my life! Quicker, more efficient and easier on my hand. I'll never go back to scissors. My mat which is falling apart on the corners! I would have to say my rotary cutter is my favorite tool. Having to cut quilt blocks with scissors for many years, it didn't take long for my rotary cutter to become my best friend! I love my rotary cutter! I still remember the days before rotary cutters, and cutting was a lot slower and less accurate! 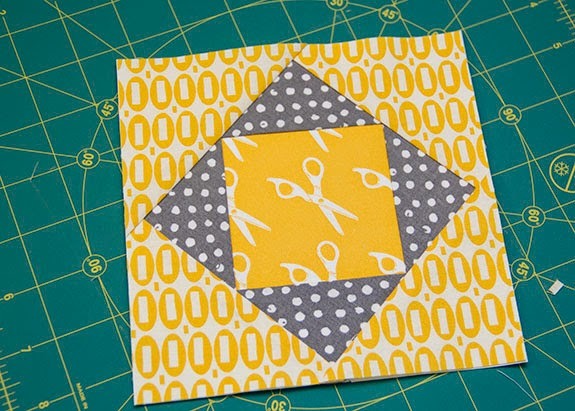 Your block is wonderful - perfect for the Olfa quil! My 6" x24" Olga ruler that I picked up for $3 at the thrift store. Before that I was using a generic brand ruler, but I was quickly converted. I would love to have on of those spinning mats though. This is a hard question....but if I had to pick just one tool, I would say my rotary cutter and cutting mat. My rotary cutter. Followed by my seam ripper! My Olfa rotary cutter is my absolute favorite tool! My first quilt years ago I cut the pieces with scissors. Thanks to Olfa, never again! Does my sewing machine count? I love my rotary cutter too - I'd love to try this small one! Cute block! 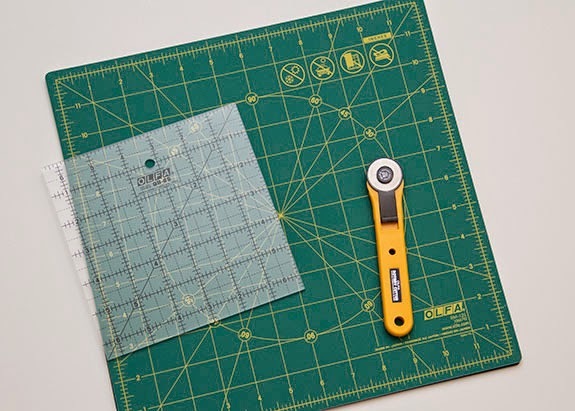 I'm an Olfa devotee myself and can attest that the right cutting mat makes all the difference in the life of your blade (as well as the accuracy of your blocks and the cleanliness of your cutting table.) So I'm going to go with my self-healing cutting mat. I do keep my rotary cutter in a pretty adorable ceramic frog as well. I love my rotary cutter, I'd be lost without it. All of my Olfa rotary cutters, of course! I have all the sizes...some more than one! Love my rotary cutters...use them ALL of the time! My rotary cutter and mat. Can't have one without the other and I wouldn't be quilting without them. Love my rotary cutter, ginghers, and wonder clips. I do love my Olfa cutter! And my Gingher scissors!! And pretty much anything made by Clover! I love my 45mm Olfa rotary cutter!! Thanks for the giveaway! It's a tie between my rotary cutter and fabric scissors. Today I love my Frixion pen! My seam ripper is my favorite! Thanks for the chance to win! I think it would be my pattern design software. Other then my rotary cutter it has to be my seam ripper. I can't live without either of these. Please count me in too... My favourite sewing tool is my rottary cutter. I just love it! My little metal sewing ruler with the slide mark...not sure of the real name! Then my seam ripper. Love my rotary cutter but after dropping it and having it slice through my slipper and foot I am pretty paranoid using it. Rotary cutters make my life so much easier! Have a few of the Olfas lying around. Besides them, I love my Gingher scissors, my Clover seam ripper, and my Bernina! 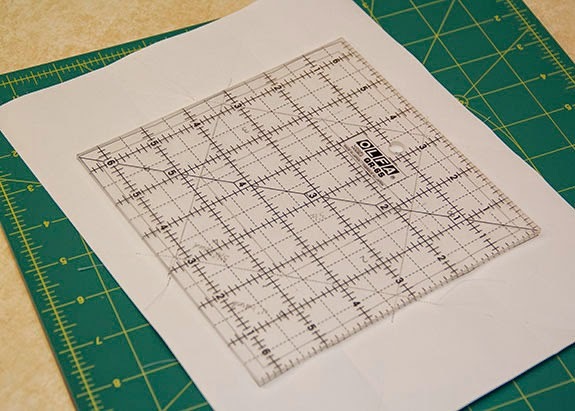 I am a beginner quilter, and I love OLFA products, please make a tutorial for teaching us how to cut fabric using the lines degree of the OLFA's rulers.